To accompany paid expansion Call of the Beastmen. Total War: Warhammer is getting minotaurs courtesy of its Call of the Beastmen expansion, but what about all the loyal customers that don't want to shell out money for the DLC - don't they deserve some extra stuff too? No, not really, but it's nice of developer Creative Assembly to provide some anyway. To accompany the release of the expansion, all players (whether they own the DLC or not) will be getting a new hero and mount, new multiplayer features and maps, an "unlockable lord" for custom or multiplayer battles, and a new A.I.-controlled opposition race. 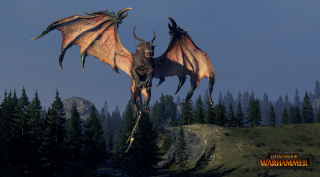 As the wiki explains, that new mount is a big old griffon: a "beautiful jade green griffon, with unique Amber College armour", exclusive to the game's new Empire hero, the Amber Wizard. Ol' Amber Eyes is "renowned for their savage appearance", and can summon a ruddy great manticore at will. So you might want to cross to the other side of the street if you see one coming. Meanwhile, four new maps are coming to Total Warhammer's multiplayer mode, during which you'll soon be able to customise your lords and heroes. Which is nice. All this free stuff will be yours this coming Thursday.